I am tired of having change all around. I hate pennies and wish I could do something useful like play a game when I have a pocket full of nickels and dimes. Now with BankQuest you can take those slivers of metal and turn them into weapons and armor for your adventurer as you play through this RPG quest. 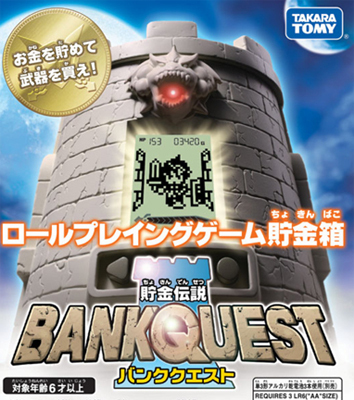 Made by Takara, famous for their Walkie Bits and other toys, the BankQuest will hold yup to 50,000 yen which is $500 American although I assume less since we don’t have $1 & $5 coins in our country and NO that stupid Sacajawea didn’t pan out into real currency so it doesn’t count. Goes on sale August 7th. That sword, I’ll pay a fine price.